Arts and craft rooms can easily become messy when we don't have a place for our supplies. It is easy to be right into your crafts and have bottles of paints everywhere. The creating is the fun part but cleaning up is not! But I have found over the years, that if you have a place for everything then everything will end up in its place. A tongue twister, yes, but is true for me. If I have an easy accessible place for my supplies, then I am more likely to clean up afterwards. Paint bottles can easily become a problem. Using a Revolving Storage Rack, is one of the easiest ways to store the small bottles of paint. There are so many colours on the market of paints, that you can quickly accumulate many of them. I was using a drawer and then a tub, but it was hard to find the colour I wanted, and many times I ended up duplicating some colours because I simply couldn't find one. 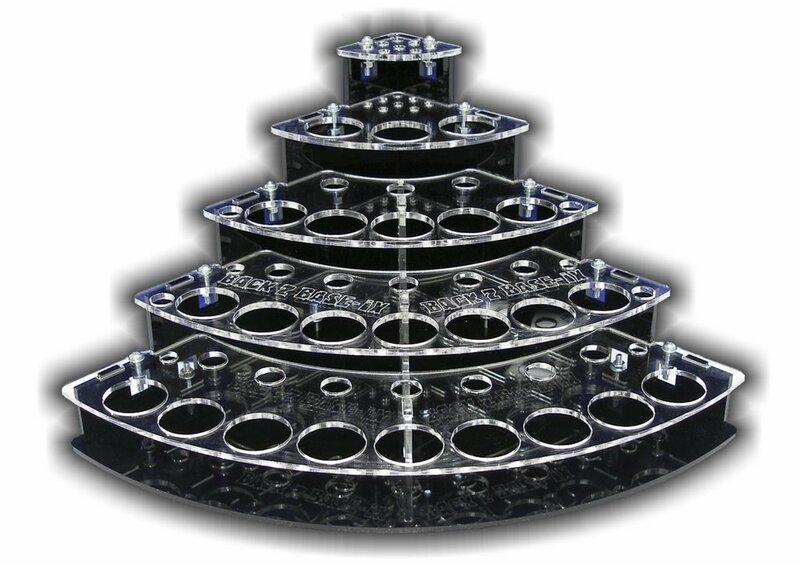 There are a few different styles of craft paint racks on the market. The top one is a portable one and the one above can be secured to the wall and has a door to hide them when your day is done. 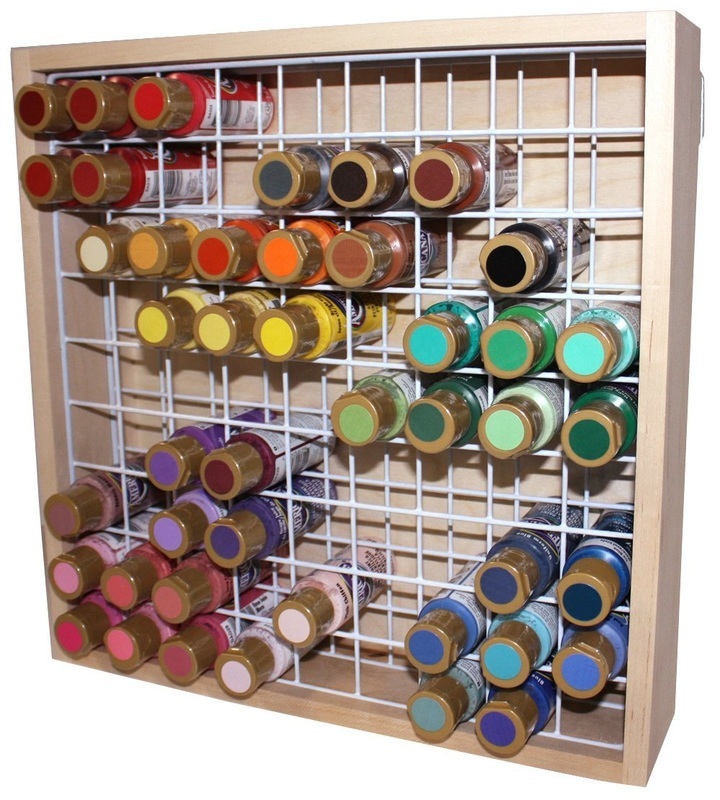 This wooden rack is made in the USA and will hold 81 bottles of the small craft paints. You could organize in colour themes as they have done in the above picture. If you have a lot of bottles you could purchase a couple and hang them on the wall. It is easy to see the colours right away. This will stop duplicate purchasing, which was my bad habit as most of my paint lived all over my desk! This works best in an area you can call your craft room and by installing on the walls you can save valuable work top space. Plus you are more likely to put them away at the end of the day. If you have a place for everything this makes it a much easier chore. If you prefer to have your paints more on hand and right in front of you while you are creating, then this portable unit may fit the bill. It is perfect for the corner and if you don't have a lot of bottles you can keep them organized in this unit. It is tiered so that you can see all of them at any time. This makes it easier for painting or crafting. Organizing Your Supplies - Crafting is fun and relaxing and for many it may be a business, but while we are creating, we can also make a huge mess. Finding the right organizing tools for your hobby or business is important. There are so many different arts and crafts out there, but if you look, you are likely to find a storage solution that will organize everything no matter how big or small your space is. Anything with small pieces, such as beads, paints, ink pads and more really needs its own organized storage to keep on top of your supplies and to end the frustration that comes along with trying to find your supplies. The first step is to try and keep them in one area. This way you are not searching the house for your special pens or paints or whatever the supply. The next step is to come up with a system that makes it easy to get out but more importantly, easy to put away too. Stacking tubs can be great but if there is a supply you use most in your creations, they need to be totally accessible instantly. I did the stacking tubs, and found that I was forever "unstacking" them to find the supplies I needed. I came across these craft paint storage racks above and thought this is much easier. Dresser Drawers - Another option for small bottles of paint is an old dresser drawer set. My friend had hundreds of small craft paint bottles, and she used a four drawer dresser to have her paints standing up in. Just make sure they are deep enough for the small bottles but not too deep. Her brand hand the colour chip on top so she could see at a glance the colour, and each of the four drawers held her colour themes. If you have the room in your crafting area, you could go this route. You can get cheap old dressers at second hand stores and thrift stores. You could make them your next painting project too. Just get the style where the drawers are not too deep and this may work for you. Just get those craft paints in their own area, and your creating will go much smoother.